Nicolas Maduro’s government called the sanctions part of “a systematic campaign of aggression” by U.S. President Donald Trump’s administration. 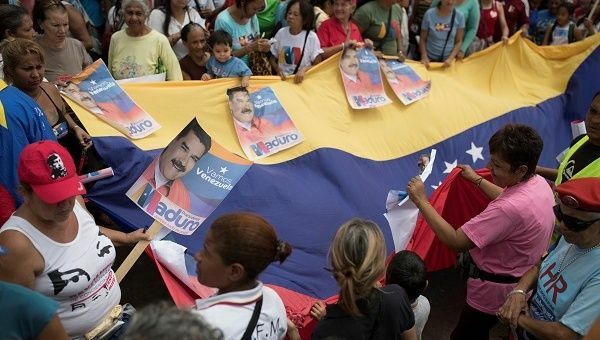 May 19 (teleSUR) Venezuela has accused the United States of using new sanctions against its government’s top officials to sabotage the May 20 presidential elections. For the first time, Washington on Friday publicly accused incumbent President Nicolas Maduro of profiting from illegal narcotics shipments and imposing sanctions against the No. 2 official in the ruling Socialist Party (PSUV), Diosdado Cabello. In a statement, Maduro’s government called the sanctions part of “a systematic campaign of aggression” by U.S. President Donald Trump’s administration and said they had no legal base. “It’s not surprising that on the eve of a new vote, when the Venezuelan people will come out to defend their democracy against the imperialist aggressions that try to derail it, once again the U.S. regime tries to sabotage the elections,” the statement read. The U.S. Treasury on Friday imposed sanctions against Cabello, his wife Marleny Josefina Contreras, who heads the country’s tourism institute, and his brother, Jose David. Maduro is expected on Sunday to fend off a challenge from opposition candidate Henri Falcon, who is breaking the mainstream opposition coalition’s boycott of the vote.